800ForAll.com is the easy way to search for and acquire the perfect toll free vanity numbers! Securely pay for the number - it’s now yours for as little as $44.95! The perfect vanity toll free number for you is just a few clicks away! You clicked on Help to get this display. What do the rest of the visible buttons do? Search – Lists toll free numbers available now that match your search criteria. Help – Displays this help popup. Contact – Send us feedback about this service. Looking for a vanity number for your Las Vegas based realty company? Enter "Vegas" and click Search. Looking for a toll free number that matches your office number? Just enter the 7 digit number in the number field (e.g. 5551212) and click Search. Enter & to repeat a digit (e.g., &&& finds numbers where 3 numbers repeat; &0&0&0 finds any number like 707070 or 808080). Click the Starts With button to look for nnn at the beginning. Click the Ends With button to look for nnn at the end. You can combine Starts With or Ends With with * and & to find cool numbers (e.g., Starts With DOG**00 will find any spare numbers starting with DOG and ending with 00). Note that you must enter 3 to 7 characters containing letters, numbers, or the characters * and/or & in the Search field. Entering incorrect information (or too little information) results in an error message display. Suppose that you are a golf instructor looking for a vanity number containing the word "4golfer". Enter "4golfer" in the Number: field, and click on the Search button. Suppose we try again - enter the word "4golf" (e.g. looking for a toll free number that contains the string "4golf"). 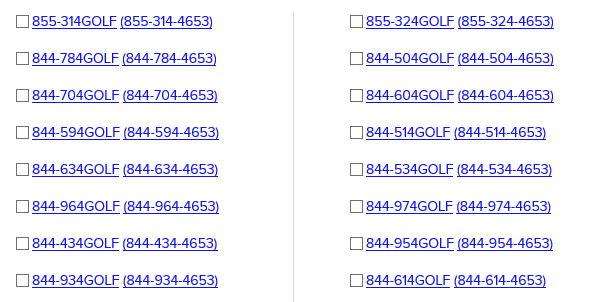 Enter "4golf" in the Number: field, and click on the Search button. This time numbers are available. In the blue area you will see more about the search results. Clicking on the hyperlink on the number (e.g. 855-314GOLF) produces a dictionary of possible other spellings of the number. Clicking on the numeric hyperlink (877-735-4653) displays the history of the toll free number, with statuses, change dates, and responsible organizations. Note multiple columns of results were returned. Up to two (2) columns may be displayed. Remember - look around, keep trying and keep refining your searches. It pays to experiment! Once you find a number that you like, you may Reserve it for your usage. Suppose the Golf Instructor does the search on "4golf" and finds a number that fit his or her needs. After searching 877-4GOLF06 is available - the “Square Box” Button is active next to the number. The user clicks the “Square Box” Button. The users may select 1 or multiple numbers. When the user has selected all numbers they desire, please click “Add to Cart”. This will add the selected Toll Free Number to your cart. The user will now be redirected to “Verify Your Purchase” page, displaying selected number(s). Numbers will not be reserved until and unless the user clicks the “Purchase Number(s)” button. By clicking on the “Purchase Number(s)” button, it redirects the user to the payment (Purchase Number) page. If the user desires to purchase a few more numbers, they can continue shopping by clicking on the “Continue Shopping” button; this will redirect the user back to the “Search for numbers page”. After the user selects “Purchase Number(s), they will be redirected to “Your Order Recap” screen. Once on the “Purchase Number” page, the user enters the appropriate Contact Information and Credit Card Information. Make sure to also “Enter the Code You see below”. “Thank you for your purchase! Once the user has successfully purchased and an account has been created, the user can log into that account, review their purchases and obtain additional numbers without entering their information.